This is a story about smoking and the impact it has made on my life. I'm currently on my 3rd time quitting smoking after finding out in a chest X-ray that I have a nodule in my right lung. I'll have statistics in this article about the negative effects of smoking but I will not being going in depth with it because it is widely known that the effects are horrid at best. Growing up in Detroit smoking is a fairly common practice with the amount of factories and auto industry-related jobs in the city. I took up smoking at the age of 17 because of a furniture warehouse job I was working out of high school. At this job you were only allowed 15 minute breaks every few hours if you were a smoker, so the decision to get breaks from work seemed like reason enough for me at the time because my lack of good-decision making. Smoking continued to be an easy choice to keep in my life. It got me out of work for hours out of the day, it was accepted at all of the parties I would go to, the friends I hung out with, and to be honest just the feeling of independence. I carried out this for a few years and never really had any plans of quitting and thinking I could quit at any time because "I can't get addicted to anything" Very common things we as a society teach our children but ignorance always interferes. Through college I hid it from my parents that I had done this and when it was discovered I told them I only used to smoke when I drank. I then moved into an EMT/Paramedic job and my smoking became even more frequent to deal with the caliber of work as well as the stress that came with the job. It almost seemed as an easier way to relieve the stress of being on a Detroit Ambulance, talking about it almost seemed as a sign that I had lost control however I was only losing control over smoking's hold on me. My smoking continued easily until I made the decision to join the Air Force. Through basic training of 8-9 weeks I was allowed no contact with any tobacco products and honestly with all of the other stressors I was dealing with it didn't bother me at all. I didn't even think about it until I graduated basic training and went to my technical school training where I immediately picked it back up to meet new people out at the smoke pits on base. 3 Years at this point, I had made the promise to myself I would quit before 5 years. When I got to Arizona as my first base I had been smoking with my new sponsor so it was accepted at my new base as well. About one year at Davis-Monthan I had decided it was time to quit. The military offers tons of free smoking-cessation programs that are very good so I went the route of Chantix Stop Smoking Pill. CHANTIX is a non-nicotine prescription medicine. It works in two ways. It targets nicotine receptors in the brain, attaches to them, and blocks nicotine from reaching them. It is believed that CHANTIX also activates these receptors, causing a reduced release of dopamine compared to nicotine. 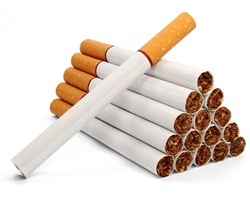 It's recommended that you begin your CHANTIX treatment a week before quitting smoking. This gives CHANTIX a chance to build up in your body. You may smoke during the first week of your CHANTIX treatment, but you should stop smoking completely on Day 8 of your treatment. Chantix worked perfectly for me and I had quit smoking for 2 months with the few side effects of some nightmares but I couldn't have been more thankful. When my sponsor and one of my best friends now had returned from Afghanistan he had smoked like crazy eventually pulling me back into it. I smoked the whole time until I went to Afghanistan, figuring I would quit smoking over there like many people try to do. I couldn't have been more wrong. The ultimate stressful environment and cheap turkish cigarettes at about $12 a carton (10 packs) gave me every reason not to quit. I came back from Afghanistan and continued smoking until a few months ago. I had been unfortunate enough to catch Pneumonia which forced me to quit but late upon my Xrays had found that there is a nodule in my lung. The doctors have told me it is likely 90% chance it is from the Pneumonia but even that 10% chance it could be cancerous was enough for me at 22. At 22 I've already had the fear of cancer from only 4 years of smoking making it an easy choice and i never plan on looking back. I kept my promise of 5 years to myself, but to be honest If i didn't see the light from this I would've easily kept this going my whole life.